Today I brought home some two-component glue, and this night it was time to strengthen the joints where the kyebed was cracked. 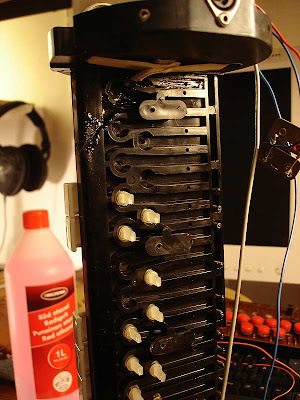 While was in there, I also decided to clean out and lubricate the keyboard mechanics. In a cupboard at home I dug out a roll of fibre glass mesh, the kind used for gypsum wallboard joints. I cut small pieces of it to use as "rebars" together with the epoxi. An exemple of the fibre glass rebar. It will now be covered in epoxi, and I did the same on the other side. While the glue was hardening, I went looking for suitable lubricants. 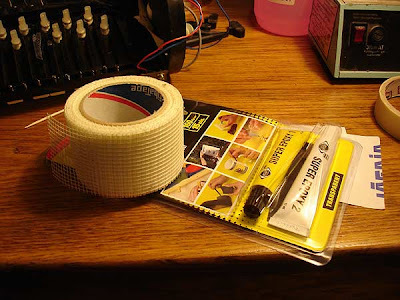 I found a bottle of sewing-machine oil and some spray for nail guns. The sewing-machine oil was fine. This is what a Tubon key looks like. 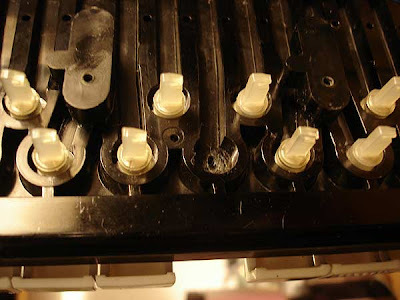 There is a push-rod with a slotted piece of plastic where the contact spring will fit. In the back end of the key there is a screw and a spring. The tension of the spring is adjusted with the nut. The nut is secured with some sort of loctite. 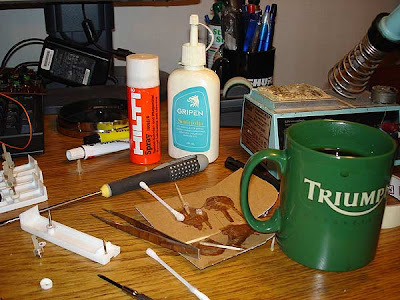 Using a topsy, I applied some oil to the pushrods. 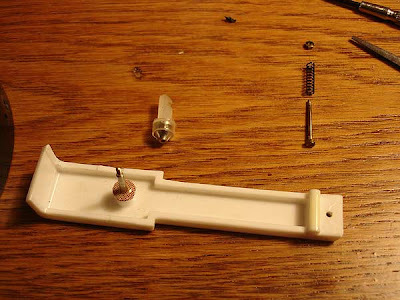 The pushrod goes through a hole in the keybed, and a felt washer. The keys had a tendency to stick in the holes, so I used a small round file to clean out the holes until the pushrods moved smoothly. 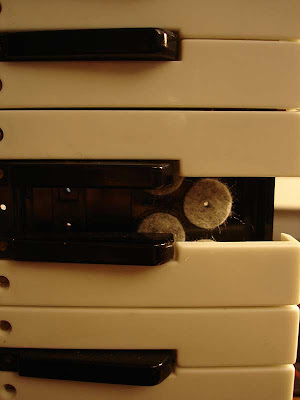 This is what the felt washer looks like. I went through all keys, because all of them were sticky, with file and oil, and put it all together again. Now the entire keyboard works nice and smooth. 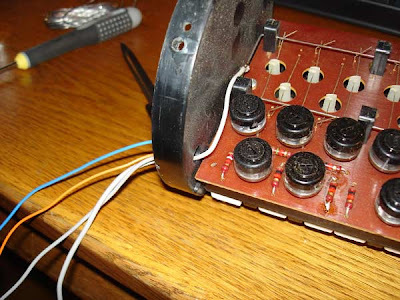 To wrap it up, I connected all of the contact springs, and adjusted them using a set of flat-nosed pliers. The keyboard is now on a shelf above my desk. 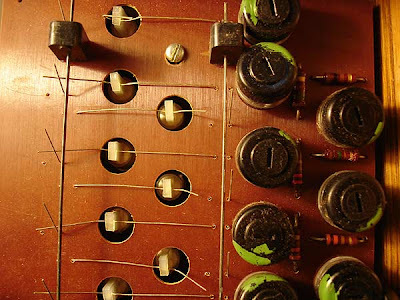 I have ordered a four-pin DIN plug so I can connect the Tubon to an amplifier, but until then I will continue the reverse-engineering and take a look at the rat's nest behind the left hand controls. But not tonight. 1. There was no cable. 2. The keyboard had taken a blow, resulting in a cracked keybed. Regarding the cable, it will not be a major problem. I have to order the necessary four-pole DIN plug and make myself a new one. Five-pole plugs are easy obtainable anywhere, but four-pole ones aren´t exactly stock at my local radio/tv shop. Of course, I could replace the four-pin socket, but then it wouldn't be original anymore. Two pins are audio signal output, the other two I believe are shorting to turn the instrument on. Plug in = Tubon on. Plug out = Tubon off. Tubon up on the table. Yank the end cap off and remove all fastening screws. 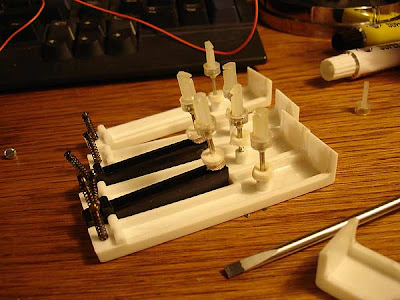 The keyboard assembly slide out a bit, but can´t be completley taken out at this stage. 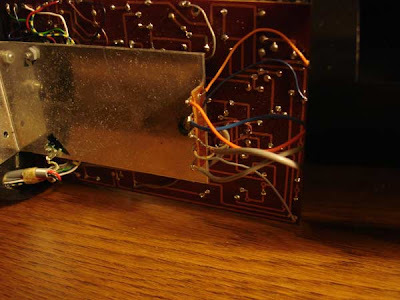 This is because the cables going from the keyboard goes into the head end of the Tubon, and is soldered to a terminal strip in there. 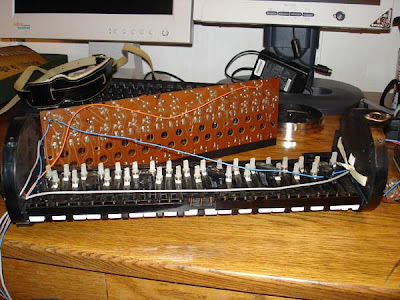 The head end is removed, and the cables to the keyboard are de-soldered. 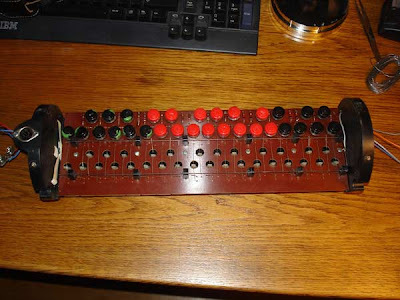 Now both the keyboard and head end can be removed from the tube. Here we have the main cirquit board with almost all of the electronics. 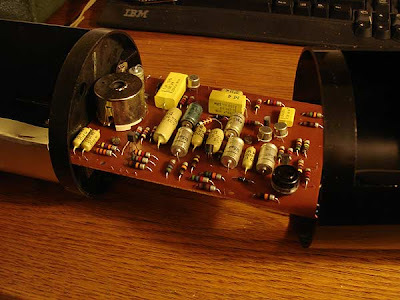 There are a few germanium transistors (2N1302, 2N3703 and BCY31), a few Cs and Rs and a really large coil. 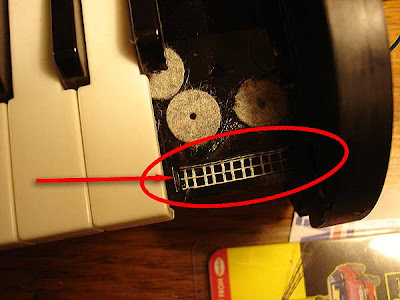 On the keyboard end, we can clearly see the cracked keybed. The rest of the mechanic stuff seem OK. A few bent keyboard contact springs, but most likely these can be straightened out. This is the back side of the keyboard assembly. 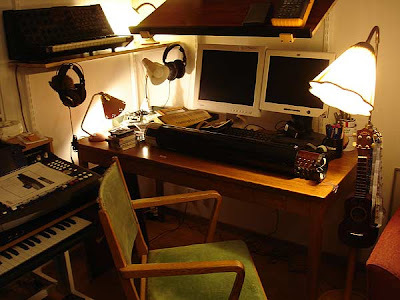 We see a bunch of sealed trimmer pots and a somewhat traditional one-buss keyboard of the "J-wire" type. Here is a close-up of the key contacts. As you may see, a few of the contact pins are bent towards the camera. This will be easy to fix with a gentle hand and a pair of flat-nose pliers. There is one thing I have never seen before: note the small angled guide-wires that will force the key contacts to move slightly sideways before making contact. Here are the cables coming from the keyboard assembly. They are routed through the bulkhead, and will terminate in the head end. Then I removed the fastening screws to the cirquit board, unhooked the contact wires from their actuators, and took the entire cirquit board off. By now it was late at night and I decided to call it a day, and continue the following evening. Next, I will remove the keys - I need access to both sides of the keybed to be able to repair the crack, and strengthen the structure. Welcome to my Tubon blog. Now, what the heck is a Tubon? If you do a search on the Internet, you do not come up with much useful information. 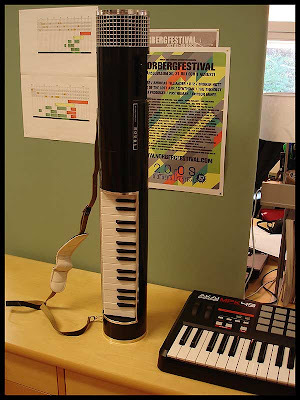 The first time I ever saw a tubon was in the mid-80's in a swedish music dictionary on "elektrofoner" - electrophones, electronic instruments. 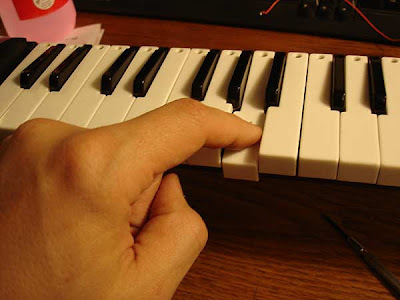 There was an illustration of a man playing a tube-shaped instrument with a small keyboard. Later on I became aware of the classic swedish humourus song "Vad i helvete har de för sig på banken efter tre?" ("What the hell are they doing at the bank after three o' clock?") where Hasse Alfredsson play the Tubon bass. Youtube: Vad i helvete har de för sig på banken efter tre? 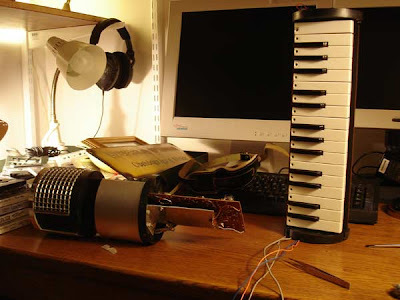 The Tubon is a tube-shaped electronic monophonic instrument with a guitar-strap. It is primary a bass instrument with preset sounds like tuba, contrabass, electric bass etc, and is played staccato. It was made in the late '60s in Gothenburg, Sweden by a company called Joh Mustad AB. 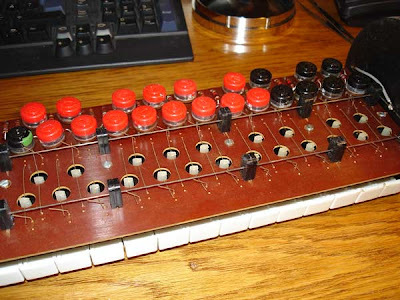 The same company also made the tube organs Bergman Klavitron and Klavinette. The Mustad Tubons also seem to have been sold in the UK under the "Livingston" brand. 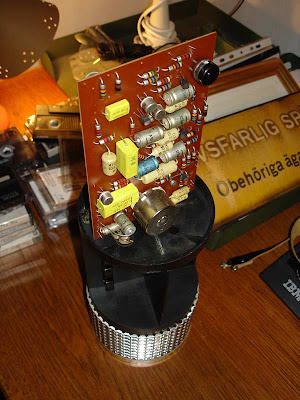 Numerous swedish pop and rock acts used this instrument in the late 60s and early 70s, but there are also images showing Paul mcCartney playing one. However, I find no evidence that the Tubon actually found its way onto a Beatles record. 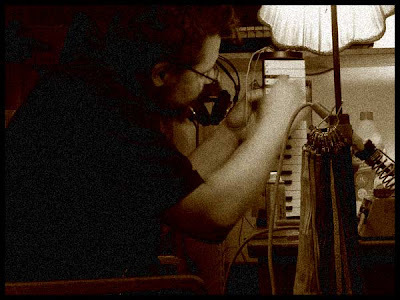 Ralf Hütter in Kraftwerk also used one of these in their early years as a bizarre kraut band. I have been looking for a Tubon for like 25 years, and recently I got my hands on one via an online auction. I paid way too much, but i was so fed up on looking for one so I just had to have it. 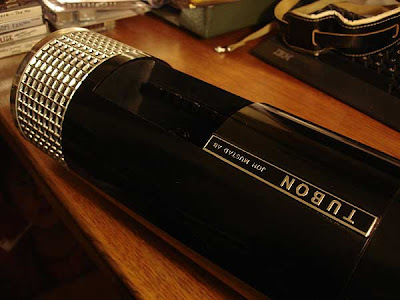 The tubon was in quite good shape except for the fact that the keyboard had taken a blow, and the keybed had cracked. It turned out to be not too hard to fix. 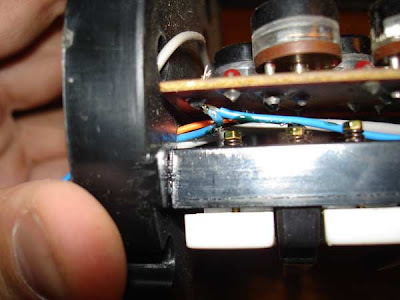 As I mentioned, there is very little information on the Tubon on the web, so I decided to do an extensive documentation on the instrument as I would take it apart to fix it. Schematics are nowhere to be found, so I intend to do a serious reverse-engineering. All I have found are a few patents on the instrument, but those doesn't cover the electronics. Stay tuned for some serious tubonism! Ever heard of the Tubon? 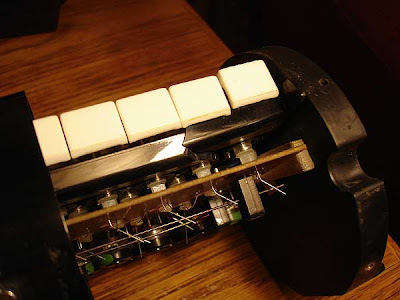 The obscure and mythical electronic instrument which possibly was the world's first "strap-on"-keyboard. Made in Gothenburg, Sweden in the late 60s by Joh Mustad AB - but also seen branded "Livingston" in the UK. There is very little information on the Tubon on the Internet, and that is the reason for this blog to be created. I intend to present and document a live specimen of this rare instrument, and the process of refurbishment and reverse-engineering.